I've already told you guys that I joined Shareasale.com. 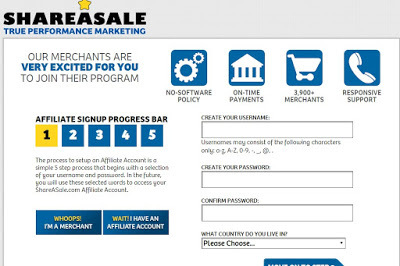 It is an affiliate marketing network based in Chicago, IL USA. providing pay-per-sale, pay-per-lead, and pay-per-click programs for webmasters. Some merchants also provide pay per post and paid banner ads. I joined because I want to earn while blogging. There are times that my mind is full of thoughts, so I started blogging, one way of delivering everything I have in mind. I mostly write about my family, parenting/motherhood and some of the things that I have experienced. I have discovered about blogging when I got a token of appreciation from Johnsons Baby Philippines. They gave me a gift pack for being an active follower on their Facebook page, then they conducted contest about babies and I started joining and that's the first time I posted on my blog, my entry about my baby Queen. And the rest is history. 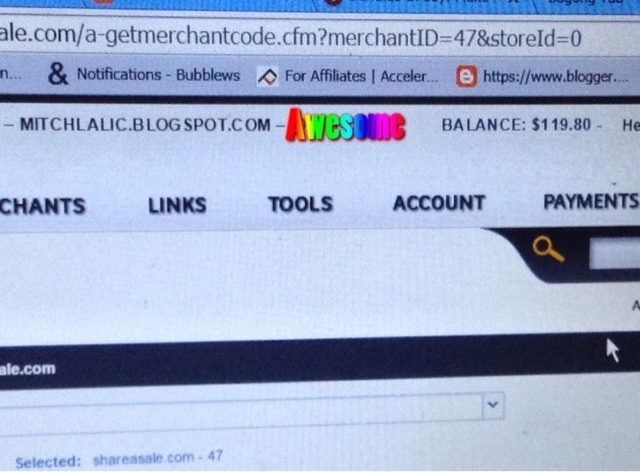 Shareasale have over 3,900 merchants, mostly popular merchants like Adidas, Reebok, zulily, Gymboree and much more. Joining ShareASale affiliate program is very easy, Whichever part of the world you are in as long as you have a blog you can join and earn at ShareASale! Sign up as an affiliate here fill up the required details on the form and wait for the approval, it will be reviewed in just one day. If you're approved, it's time to set your account details, Just go to ACCOUNT- EDIT SETTINGS. If you're U.S Based you should fill up the w9 form for faster cash out payment and if you're outside the U.S you can simply fill up the Non-USA certification. I will discuss to the next post about where will my payments be deposited. But as of now, I have already $119.80 earnings from BONUS opportunities from awesome merchants. And I am so happy that I've got one sale already and my commission was auto deposited to my ShareASale account. Here are the awesome merchants that I am working with. If you want to join, just click on the merchants below, aside from the sale commissions you can get, some of those offers paid posts and paid banner ads. CELLSAVERS - is the easiest, most professional & safest way to have your device repaired at your preferred time & location. All repairs are backed by our lifetime warranty and high rated customer service. STELLA & DOT -a fashion social selling company that creates flexible entrepreneurial opportunities for women. Their boutique-style jewelry and accessories line is available exclusively online and through in-home Trunk Shows by Stylists. Stella & Dot’s distinguished designers create one of a kind collections that are adored by both fashion editors and celebrities. CRICUT- offers Cricut® machines, 50,000+ images to cut, and project supplies ranging from cardstock to iron-on film—plus inspiration, ideas, and a creative community! Check out their products here. GRAMMARLY- is the world's leading software suite for perfecting written English. It checks for more than 250 types of spelling, grammar, and punctuation errors, enhances vocabulary usage, and suggests citations. Free sign up here. GYMBOREE - selling high-quality, stylish children's clothing and accessories for three great brands, all under one program. Gymboree's clothing and accessories are created to celebrate kids being kids in unique, head-to-toe looks. Gymboree clothing is designed with colorful, high-quality fabrics and detailed touches throughout. Janie and Jack offer classic children’s clothing rich in fabric, design, and detail for girls and boys up to size 12 online. Heirloom-quality looks feature finely-crafted details such as hand-embroidery, hand-smocking, and special prints. ELIMIDROL- is the only opiate withdrawal product guaranteed to work and is non-addictive and non-habit forming. Elimidrol provides a one-of-a-kind effectiveness and potency that is unmatched by any product in the industry. Our scientifically formulated detox support supplement will provide you with the strength and comfort to successfully overcome opiate withdrawal by alleviating the intense mental and physical discomfort during the process. Check out their products here. KARINA DRESSES- is one of the country's fastest growing retailers of premium quality MADE IN USA women's clothing! Our dresses are vintage-inspired, independently designed & made with love. We believe in the innate beauty of all our customers. Our dresses help women love & accept themselves, just as they are. For this simple reason our customers love us, and we're building our business by simply loving them back. Check out their products here. KIDORABLE-delights both children and the adults who love them by transforming everyday, functional kids accessories into objects that excite their imaginations and enrich their lives at play. From rainwear to backpacks to knitwear and towels, Kidorable speaks to the precious spirit of childhood. Check out their products here. MABEL'S LABELS- creates innovative and award-winning labels for babies, kids, and grown-ups. Featured in InStyle and Peoplemagazine, our sticky labels and clothing labels can be customized with a child’s name, choice of colors and icon. And, best of all, Mabel’s Labels are a dishwasher, microwave, and laundry safe! Our expanding line also includes ID wristbands, allergy alerts, and bag tags. Check out their products here. MIAMILY- HIPSTER Baby Carrier - Maximum comfort for parents with the ergonomic design allowing baby's weight is evenly distributed between the wearer's hips and shoulders. Built-in ergonomic hip seat allows baby to be always in a natural sitting position with knees even at hip level. Check out their products here. SCHOOLA-is a previously loved kids' clothing retailer, and for every dollar spent, 40% of proceeds go back to schools. With help from Schoola, schools receive much-needed money for underfunded programs including art, P.E., and music. Check out their products here. SUNBASKET - is a healthy meal delivery service offering fresh, organic ingredients and easy recipes delivered to your door weekly. You can choose your meals each week or opt into a menu plan, including Paleo, Gluten-Free and Vegetarian options. Sun Basket makes it easy to cook delicious meals, eat clean, and feel great. VIVIA FORMULA- 360 Defense System is a revolutionary super-food, multi-vitamin and powerful anti-aging agent proudly made in the USA. VF-360 is formulated from 93 scientifically validated ingredients in an FDA approved cGMP facility. Unlike "regular" multivitamins, the VF-360 Defense System was designed to work with our body both day and night. To ensure this, the VF-360 Defense System comes in a balanced morning, noon and night package. NATIONAL DEBT RELIEF - National Debt Relief has helped over 100,000 consumer get help with their unsecured debts. Offering consumers one of the lowest cost ways out of credit card debt. Reduce Your Debts Without Bankruptcy. See How Much You Can Save. Free Debt Analysis here. ACCELERATED -Excelerol is the #1 Doctor Recommended, best-selling brain health supplement in the world. Through our proprietary blend of ingredients, Excelerol is scientifically formulated to help support Memory, Focus, Alertness, and Concentration. Check out their products here. ALPHINE-EnviroQuest International has just launched their newest and unique product line of Alpine indoor air purifiers, a brand that's already well-known and quite popular domestically and worldwide! These high-tech filterless products cannot be purchased in any stores, and are a lot more effective than any filters or other brands of air purifiers available on the market today. Check out their products here. BEAUCOP- celebrates life one event at a time. We are the leading retailer of unique wedding favors, baby shower favors and party favors for all special occasions. Check out their products here. LOWELL TOMAS - proud to introduce the JackClamp - an American made and Patented grip-type clamp with some very clever engineering behind it.Check out their products here.